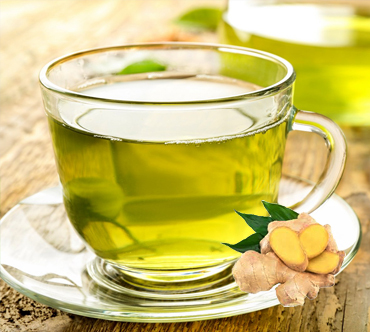 Ginger green tea This beverage with a blend of ginger roots and green tea forms a complex but flavorful taste. The mix of sweet and spicy ginger plus brisk sharp green tea has been used for several healing purposes. Its health benefits include relief from nausea. Drinking a cup of this tea before travelling can help prevent nausea and vomiting associated with motion sickness. It improves stomach performance, reduces inflammation, fights respiratory problems, improves blood circulation, relieves menstrual discomfort, strengthens immunity and relieves stress. It also helps hair health besides easing the pain of arthritis.